Leave your daily routine behind and take a thrilling ride on board an exciting three-wheeler. Feel the exhilaration of the wind in your face and enjoy the freedom that only a Razorcat trike ride can give you. Not only will you have a fantastic ride on our Razorcat trike but you will also experience the famous World Heritage site that has just got to be seen, Stonehenge. On a spiritual level, it attracts people from all over the world. From an engineering point of view, it will astound you when you realise it was built over 3500 years ago and some of the stones weigh more than 40 tons – and came from Wales. From Bath we make our way over the toll bridge and on to Box. We pass Melksham and travel along the beautiful roads to Seend and Worton. We then hook up with the A360 that takes us over the Salisbury Plain. This is a fabulous road with fantastic views, taking us through some pretty little villages on the way. As we top a rise in the road, Stonehenge is revealed in the distance for the first time – an awe-inspiring sight. We stop here for you to look around and take the tour and some photos. Heading back, we ride a short distance on the Exeter road before cutting away to Warminster along the lovely Wyley Valley. By-passing Warminster, we make our way to Limpley Stoke and then back to Bath. A fantastic ride to an iconic location – perfect. 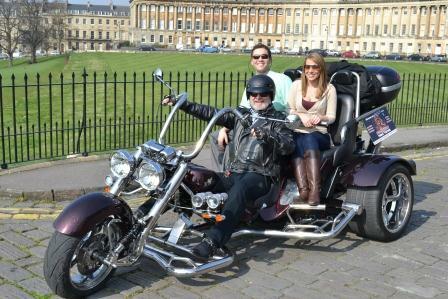 When you take a ride on a Razorcat trike, YOU become the centre of attention. The name of this festival is Irish Gaelic for “Commemoration of Lugh”. Some authors give the meaning as marriage, gathering or feast (in the name of) of Lugh. The meaning remains basically the same: Lugh is the Deity of Lughnasadh, and there is a feast. One of several historic sources for the four Celtic fire festivals Imbolc, Bealtaine, Lughnasadh und Samhain is the early medieval Irish tale “Tochmarc Emire” (The Wooing of Emer), which is part of the Ulster Cycle. In the form we know it today it was written in the 10th or 11th century CE, but it is safe to assume that this tale – like so many others – contains a much older nucleus. The tale narrates how the hero Cú Chulainn is courting Emer. He receives several tasks to fulfill, one of them being that he must go without sleep for one year. As Emer utters her challenge, she names the four major points of the Irish-Celtic year, as they are also mentioned in other Irish sources. Doing this, she does not use the solar festivals, nor Christian ones, which were certainly well known and established by the 10th century. Instead Emer choses the first days of each season. One of these days is Lughnasadh, marking the beginning of fall. It takes place on the 1st of August, a date internationally agreed upon, or on the day of the full moon next to this date, if you want to celebrate when the ancient Celts probably did. Since the Celtic day started with sunset, the celebration takes place on the evening before the calendaric date. Lughnasadh marks the begin of the noticeable descent of the Sun into the darkness of winter. From the connection between the Earth (female principle) and the Sun (male principle), the marriage of the Sky Father (Sun God) with the Earth Mother we celebrated at Bealtaine, emerge the fruits of the first harvest of the year. Lughnasadh is a time of joy about the first fruits. It is also a time of tension, because the dark days of winter are coming nearer, and most of the harvest is not brought in and stored away yet. The celebration of Lughnasadh includes the ritual cutting of the first grain and an offering thereof, possibly the making of a first meal and the ritual eating of it, as well as dancing. Fires are mentioned, but fire or light do not play such a prominent role as with the other fire festivals. This is probably because August is a warm month in most of Europe, with still long daylight hours, where no fire is needed. Lughnasadh celebrations are reported from Ireland, Isle of Man, Scotland, Wales and Cornwall. Another name used for Lughnasadh is “Lammas”, from the old-anglosaxon “hlaef-mass” (loaf mass, mass where the first loaf of bread is consecrated), which developed into the later medieval English and Scottish “Lammas”. As such it is first mentioned in old anglosaxon chronicles as early as 921 CE as “Feast of the First Fruits”. 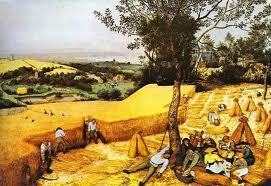 In an agricultural society the begin of the harvest was a natural occasion to celebrate and to give thanks to the Divine for Its gifts. In Bavarian tradition, the most important festival in August is the “Ascension of Mary” on the 15th of August. On this day, numerous processions through the villages and along the fields are held. During these processions, decorated bundles of herbs, consisting of up to 77 different herbs, are carried along on wooden sticks. These herbs are specially consecrated and stored away then. They are used for ritual incense burning later in the year, e.g. during the “rough nights”, the time of the winter solstice. An older name for this festival is “Maria Kräuterweih”, meaning “Day of Mary and the Consecration of Herbs”. The beginning of fall was marked by the day of St. Bartholomäus (Bartholomew) on August 24th. The original Lughnasadh customs have obviously shifted to August 15th and additionally into numerous local and regional harvest celebrations. Lughnasadh is the therefore only one of the eight Celtic festivals which did not survive in Bavaria as a compact celebration ON or near the original date (August 1st). Harvest celebrations are instead dispersed over all of August. This might have to do with the geographical situation of Bavaria, where August tends to be a rather warm month, and harvest and fall are a bit later than elsewhere. The essence of Lughnasadh is the joy of life under the knowledge that darker times are moving in. We take in the warming rays of the Sun and store their power for the times coming. At the time we celebrate the next festival, Alban Elfed, it will be fall and the warm summer days will already be a memory. Of course Lughnasadh is a very good time to express gratitude to the Gods and the Earth Spirits for their blessings and gifts that we are now receiving. In times of microwave and frozen pizza it may seem anachronistic to thank for the harvest. Many of our modern food stuffs make it hard to still recognize the waving grain on the field in them. And yet there is a way to connect with nature via the food that we eat. This is especially valid for self-harvested fruits. But also conscious eating, eating with focus on the food and not on TV or newspaper, is one way of expressing our thanks for the harvest – all year round, but especially at Lughnasadh. Stonehenge Crop Circle – Aliens, a hoax or energy rays from space? 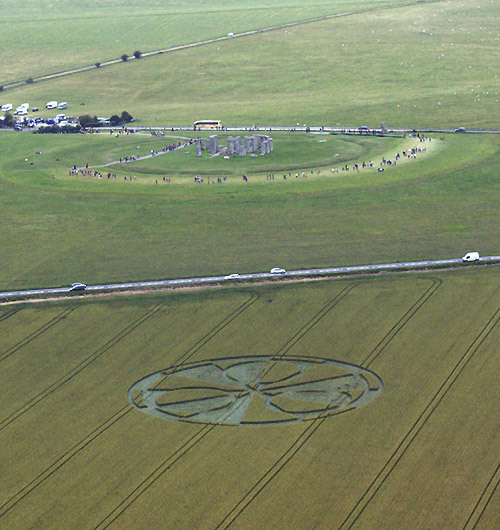 As if Stonehenge wasn’t mysterious enough, right across the road someone – aliens, hoaxers, or perhaps posessed lawnmowers – has created a giant crop circle. And nobody knows where it came from. The ancient site is proving to be a popular attraction for crop circle-creators lately. Yesterday’s 60 metre wide effort is just the most recent in a string of field phenomena in Wiltshire over the last few weeks, reports the Daily Mail. Stonehenge is the most important prehistoric monument in Britain. Cynics claim crop circles are the work of computer scientists and volunteers, but enthusiasts argue nights – particularly in Summer – aren’t long enough for humans to get the work done by morning. Taking a Guided Tour of Stonehenge Aotearoa – Hire a Henge! 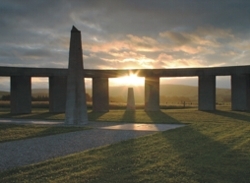 Stonehenge Aotearoa, a full-size model based on the ancient English stone circle, shows how the Sun, Moon and stars can be used “for life and survival”. Apart from its majestic and mysterious appearance a stone circle has little meaning unless one knows how it works and why people built them eons ago. The people who built Stonehenge Aotearoa have put together a special presentation that unravels ancient mysteries and takes the visitor on a journey of discovery. 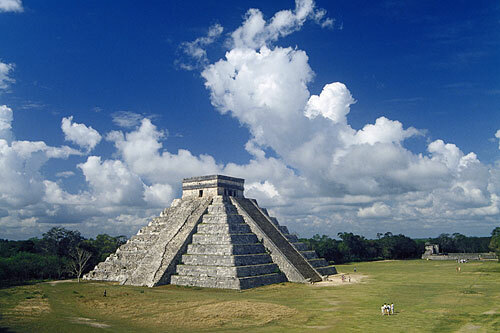 Our tours include tales from antiquity of the solstices and equinoxes and signs of the Zodiac. You will discover how stones, posts and shadows were used to unlock mysteries of the earth and sky which formed a cornerstone to the rise of civilization. A guided tour runs for just over an hour. Do allow yourself time to check in before the presentation begins. We suggest that you arrive not less than 10 minutes before your tour is scheduled to start. In addition, it is advisable to allow some free time following your tour. 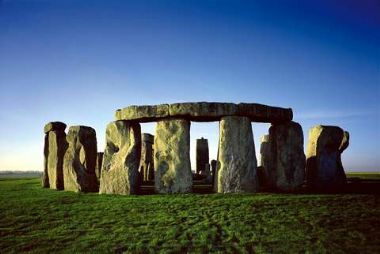 Visitors often wish to ask questions, take a second look at some of the stone structures, or visit our Stonehenge shop. Stonehenge Guided Tours are available to the public at 11am on Saturdays, Sundays and public holidays. At other times you may book a private tour – see below. From December 27 through to January 15 there will be a tour every day at 11am. The number of participants on any one tour are limited so bookings are recommended. Adults $15, Senior Citizens (65+) $12, Students (13-17yrs) $10, Children (pre-teens) $6. Bookings recommended: Phone (06) 377 1600 or book online here. may be held on any day at a time by arrangement. The fees per person are the same as those for a public tour:- $15 for adults, $12 for senior citizens (65+), $10 for students (13-17yrs), $6 for children (pre-teens), except that there is a minimum charge of $90. Thus, if you have 6 adults in your party this will cover the $90 minimum charge. Phone (06) 377 1600 or book online here. Each tour is tailored to the weather conditions. 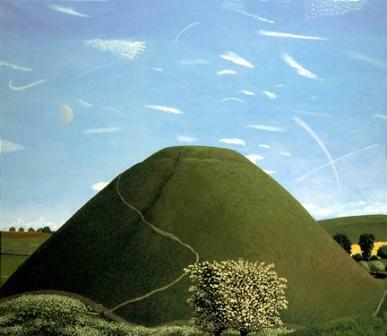 It usually begins in our lecture theatre with an introductory talk on the historical significance of stone circles and the reasons why star-lore formed a cornerstone to the rise of civilization. This part of the presentation may include an audio-visual about the Stonehenge on Salisbury Plain and Stonehenge Aotearoa. We then explore the stone circle, listen to tales from antiquity, and discover how stones and shadows can be used to unlock mysteries of the universe. Stonehenge Aotearoa can be magnificent at the time of sunrise or sunset. These tours include (weather permiting) viewing the sun rise or set over the Henge. Of special interest is the times of the equinoxes and solstices when the sun can be observed to rise or set over one of the heel stones. At these times we often have a special presentation about the equinox or solstice. See “Special Events”. Unless otherwise advertised Sunrise and Sunset Tours are only available by arrangement as private or group bookings. Maybe we should build one of these in Wilsthire? So why has the eradication of the 4,000-year-old prehistoric Priddy Circles site not caused more national interest? Hands-up folks, which of you had even heard of the Priddy Circles before last week? I would not anticipate there to be a large number of people, even locals, who had and I’m afraid to admit that I would not be among them. It’s not surprising that they’re so little known as any reference to them makes only vague speculation as to their former purpose. The same could also be said to be true of Stonehenge, but, as any users of the A303 will attest, the mysterious splendour Stonehenge has captured the imagination of many, whereas Priddy Circles have remained unacknowledged by most. I align them with Stonehenge because academic research on the phenomenon has claimed that ‘although no dating evidence has been found, they appear to be contemporary with Stonehenge’. They are also said to probably be ‘Neolithic ritual or ceremonial monuments similar to a henge, they are external rather than internal ditches makes them unique in Britain and all this makes the circles the most important surviving Neolithic sites in Somerset’. 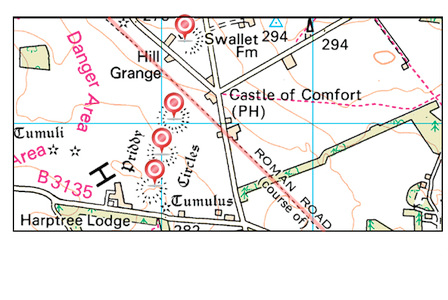 The recent rise in interest of the site is as a result of discoveries that English Heritage experts have been investigating claims that one of the four Priddy Circles has been obliterated. Land near the circles appears to have been recently re-seeded and tree saplings have been planted close by. The Ancient Monuments and Archaeological Areas Act 1979 makes it a criminal offence to destroy or damage a scheduled monument including agriculture, forestry, flooding and tipping. If you want to view the site for yourself, they can be located using the map above – you are looking for an arrangement of four circular earthwork enclosures. The circles, each nearly 200m across, are best seen from the air. The damaged circle was the most clearly defined of the four. The total arrangement covers roughly 1.2km. Other eyewitness accounts can be found at the Modern Antiquarian website. English Heritage has refused to be drawn on the extent of the alleged damage at this stage. To see the full extent of the damage from an aerial perspective, check-out these astounding photos by Pete Glastonbury.